Sjögren’s syndrome is an autoimmune disorder in which the mouth and eyes become extremely dry. Sjögren’s syndrome is often associated with other autoimmune disorders. Like other autoimmune disorders, Sjögren’s syndrome occurs when the body’s immune system mistakenly considers parts of the body as foreign invaders. People with this disease have abnormal proteins in their blood, suggesting that their immune system is reacting against their own tissue. While the immune cells should attack and kill invaders like bacteria, viruses, and fungi, these cells should not attack the body itself. In autoimmune disorders, however, cells called antibodies see tissues of the body as foreign, and help to start a chain of events that results in damage and destruction of those tissues. There are three types of Sjögren’s syndrome. Primary Sjögren’s syndrome occurs by itself with no other associated disorders. Secondary Sjögren’s syndrome occurs along with other autoimmune disorders, like systemic lupus erythematosus , rheumatoid arthritis, scleroderma , vasculitis , or polymyositis. When the disorder is limited to involvement of the eyes, with no other organ or tissue involvement evident, it is called sicca complex. Women are about 10 times more likely to suffer from Sjögren’s syndrome than are men. It affects all age groups, although most patients are diagnosed when they are between 45 and 55 years old. Sjögren’s syndrome is commonly associated with other autoimmune disorders. In fact, 30% of patients with certain autoimmune disorders will also have Sjögren’s syndrome. The cause of Sjögren’s syndrome has not been clearly defined, but several causes are suspected. For instance, genetic factors play a role, in that the syndrome sometimes runs in families. In fact, autoimmune diseases in general tend to occur in families with certain genetic characteristics. In late 2001, researchers announced discovery of the genetic markers that predict increased risk of many autoimmune disorders like rheumatoid arthritis, multiple sclerosis, and lupus. Other potential causes include hormonal factors (since there are more women than men with the disease) and viral factors. The viral theory suggests that the immune system is activated in response to a viral invader, but then fails to turn itself off. Some other immune malfunction then causes the overly active immune system to begin attacking the body’s own tissues. Sjögren’s syndrome is thought to be the end result of several factors including genetic, immunologic, hormonal, and possibly infectious. The main problem in Sjögren’s syndrome is dryness. The salivary glands and secretory glands (mucous/liquid) are often attacked and slowly destroyed, leaving the mouth extremely dry and sticky-feeling. Swallowing and talking become difficult. Normally, the saliva washes the teeth clean. Saliva cannot perform this function in Sjögren’s syndrome, so the teeth develop many cavities and decay quickly. The parotid glands produce the majority of the mouth’s saliva. 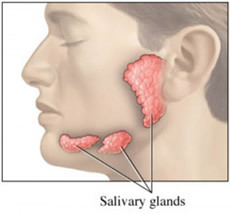 These glands are located over the jaw bones, behind the area of the cheeks and in front of the ears, and may become significantly enlarged in Sjögren’s syndrome. The eyes also become extremely dry as the tear glands (called lacrimal glands) are slowly destroyed. Eye symptoms include itching, burning, redness, increased sensitivity to light, and thick secretions gathering at the eye corners closest to the nose. The cornea may have small irritated pits in its surface (ulcerations). Destruction of secretary glands in other areas of the body may cause a variety of symptoms. In the nose, dryness may result in nosebleeds. In the rest of the respiratory tract, the rates of ear infection, hoarseness, bronchitis, and pneumonia may increase. Vaginal dryness can be quite uncomfortable. Rarely, the pancreas may slow production of enzymes critical for digestion. The kidney may malfunction. About 33% of all patients with Sjögren’s syndrome have other symptoms unrelated to gland destruction. These symptoms include fatigue, decreased energy, fevers, muscle aches and pains, and joint pain. Patients who also have other autoimmune diseases will suffer from the symptoms specific to those conditions. A rare but serious complication of Sjögren’s syndrome is inflammation of the blood vessels (vasculitis), which can damage tissues supplied by these blood vessels. Diagnosis of Sjögren’s syndrome is based on the patient having at least three consecutive months of bothersome eye and/or mouth dryness. A variety of tests can then be done to determine the quantity of tears produced, the quantity of saliva produced, and the presence or absence of antibodies that could be involved in the destruction of glands. There is no cure for Sjögren’s syndrome. Instead, treatment usually attempts to reduce the discomfort and complications associated with dryness of the eyes and mouth (and other areas). Artificial tears are available, and may need to be used up to every 30 minutes. By using these types of products, the patient is more comfortable and avoids the complications associated with eyes that are overly dry. Dry mouth is treated by sipping fluids slowly but constantly throughout the day. Sugarless chewing gum can also be helpful. An artificial saliva is available for use as a mouthwash. Careful dental hygiene is important in order to avoid tooth decay, and it is wise for patients to decrease sugar intake. Vaginal dryness can be treated with certain gel preparations. Steroid or immunosuppressive medications may be required when other symptoms of autoimmune disorders complicate Sjögren’s syndrome. However, these medications should be avoided when possible because they may thin the cornea and make it even more susceptible to injury. The prognosis for patients with primary Sjögren’s syndrome is particularly good. Although the condition is quite annoying, serious complications rarely occur. The prognosis for patients with secondary Sjögren’s syndrome varies, since it depends on the prognosis for the accompanying autoimmune disorder. Since the cause of Sjögren’s syndrome is unknown, there are no known ways to prevent this syndrome.